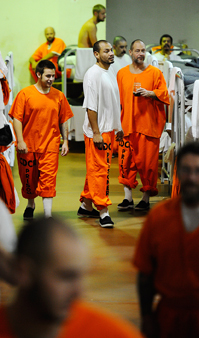 Should nonviolent inmates be incarcerated? Budget crises are forcing states to re-examine the cost of maintaining their prison and jail systems, which incarcerate more than 2 million people, the biggest national prison population in the world. Politicians are divided on whether states should downsize their prison populations by changing parole policies and liberalizing some criminal laws, such as those governing drug offenses. Proponents of downsizing, including conservative Republicans such as potential GOP presidential hopeful Newt Gingrich, argue that states have been putting too many low-risk offenders in prison. They contend that expanding alternatives to incarceration would reduce prison costs and lower crime rates. But many prosecutors point to a sharp drop in crime in recent years as evidence that prison works. Lowering incarceration rates, they contend, would put society at greater risk of rising criminal activity — and eventually, rising costs to imprison a new wave of offenders.